Welcome to our new VOKRA blog! I’m Morgan and I’ll be sharing some of our awesome rescue stories with you here over the next while. We hope you’ll feel free to talk to us in the comments section, share posts you like, and let us know if there are things you want to hear more about. What better way to kick things off than where it all begins, with mothers! We want to wish all our volunteers, fosters, adopters, donors and supporters who also happen to be moms a very happy Mother’s Day. Yes, we are Vancouver Orphan Kitten Rescue Association, but…well, those kittens come from somewhere! So Happy Mother’s Day to all the mothers in VOKRA’s care right now too. Sometimes we know a mama cat’s story, sometimes we don’t, but we always work hard to make sure the rest of her story is a happy one. Once her kittens are weaned and adopted into loving, forever homes, we take care of mama until her milk dries up and she can be spayed. Then she goes to live with one of our foster homes until the perfect home for her can be found. FUN VOKRA FACT: Did you know we have approximately 350 fosters right now? These are volunteers who agree to take a cat or kittens into their homes and care for, feed, play with, snuggle, and love them while we match kitties with adopters. VOKRA covers the cost of food, litter, and any vet expenses. Our fosters’ responsibility is to spend time with our cats. Pretty sweet gig, huh? If you’re interested in fostering you can get more information on our website. They may not be as squeal-inducing as tiny fluffy-butted kittens but our mamas are all beautiful cats with lots of love to give. They’ve nursed and cared for their babies and now they deserve to be taken care of too. One of those mama cats is Calantha, Callie for short. 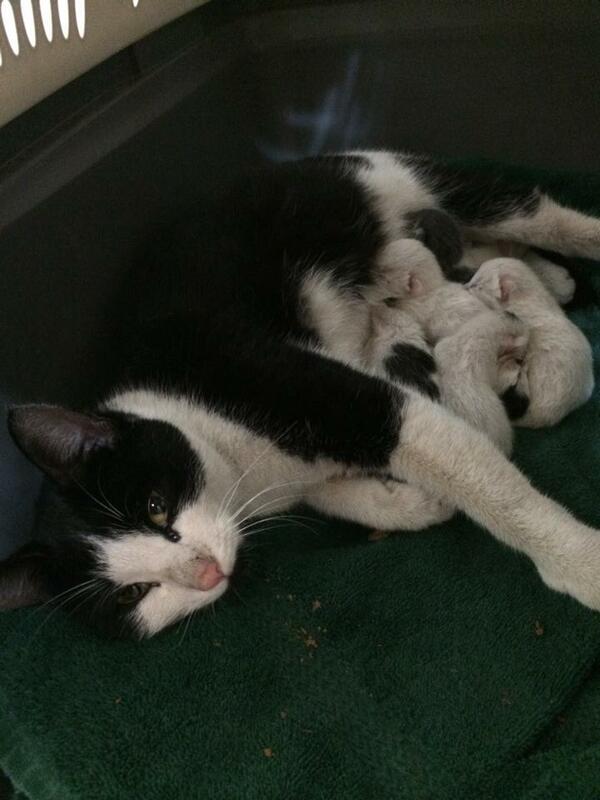 This beautiful girl gave birth to her babies in someone’s flower bed! It was almost midnight when I found out we’d received a call from a family who discovered Calantha in their yard. We knew that an exhausted mom and her newborns would be coyote snacks for sure if we didn’t get her right away so off I went. All I knew was the address and “flower bed”. The lights were out at the house and I was so worried I was going to set off a security alarm climbing around, searching for this cat! There was nothing in the bushes or flower beds in the front yard…except a young skunk I mistook for the cat for a second. Luckily, Skunky remained calm and decided not to spray me. I walked around to the rear of the house and quietly went through the back gate. Nothing. Just as I was about to turn around and leave, I spotted something. 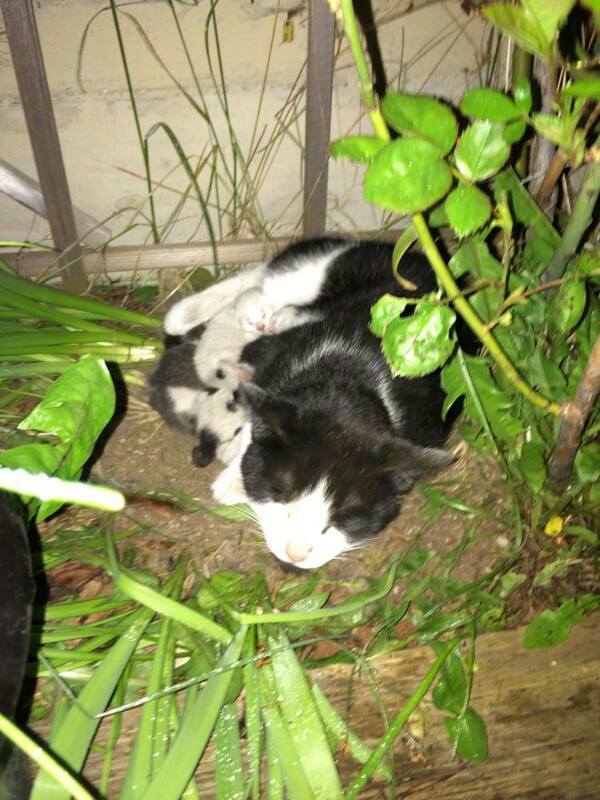 There, in the flower bed, was a young cat and her babies who were so tiny, they’d obviously just been born today. She was covered in dirt (you’d be too if you’d given birth in a flower bed) and hissed at me a little but she didn’t get up and bolt. I talked softly to her and inched slowly closer. I fed her a little bit of the stinky tuna I use to bait our humane traps with and she gobbled it up. She was absolutely ravenous. (Again, you’d be too if you’d given birth in a flower bed.) I tried luring her into the cozy carrier I’d brought but she refused to leave her babies. I didn’t know how the heck I was going to get her out of there. My phone was buzzing at me like crazy. I’d let the team know I’d found her and they all had questions. How many babies? Is she tame? Can you get her? Are all the babies okay? I was texting with our Head Trapper, Maria the entire time and she coached me through everything as this was my first encounter with newborns in a garden! After a while, mama let me pet her and we knew she was tame. Since I couldn’t get her to budge, Maria suggested I gently pick up one of the babies and put it in the carrier. “Won’t she bite me if I do that?” I asked. Probably not? I wasn’t thrilled with those odds. But I went ahead and picked the first one up. Mama looked me in the eye but she didn’t seem too worried about me. Sometimes they just seem to know who to trust. Then I picked up another baby…then another…four…five…six…holy cow…SEVEN BABIES! Usually mother cats will go to their babies but she seemed too tired to move or maybe just afraid of the carrier. I finally just told her it was time to go and picked her up and put her in there too. She didn’t resist, just curled up with her babies and began to nurse again. Phew! I took her home and quietly set her up in our basement bathroom while my family slept, leaving a big note on the door that said “THERE ARE KITTENS IN HERE! DO NOT OPEN THE DOOR!” so my bleary-eyed kids wouldn’t terrify her in the morning. I named her Calantha which comes from the words Beautiful and Flower in Greek. At least, that’s what the internet told me; it might actually mean “Hey! Feed me, I just had seven babies in a flower bed!” Once her belly was full of food, she seemed so happy to be warm and safe. She let me pet her while she lay down with her babies and she began to purr. Callie went to our Operations Centre the next morning so we could intake her and Karen could check over mama and all her kittens. One of our volunteer fosters came and picked her up and took her home where she settled in immediately. She’s a wonderful mother and such a sweet cat. Once her babies are adopted she will make a loving addition to one lucky family. Isn’t she a beautiful cat? And look at those tiny little cow kittens! Every time VOKRA rescues a pregnant mom or a mom with newborn kittens, there are a lot of costs involved. Vet care, food, litter, spaying costs, transportation…it all adds up. 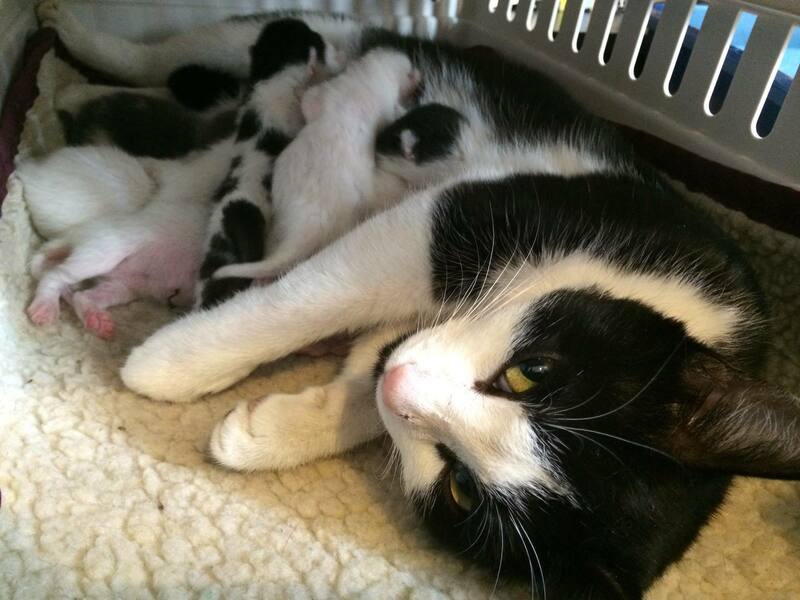 We are entering into “kitten season” and will soon be overwhelmed with moms like Casantha and her babies. If every mom we rescue costs us at least $400 to care for, and we will rescue hundreds of cats over the next few months, many of them moms, you can imagine how our costs soar this time of year. This Mother’s Day, we hope you’ll think about all the beautiful mama cats VOKRA has saved this year and all those who will need saving in the months to come and make a donation in honour of them. You can also support VOKRA by picking out something for the moms in your life from our online store. We hate to think what would have become of Callie if the homeowners hadn’t discovered her and called us. But now she’ll have a great life and so will her babies. Please contribute today and help us save more moms and babies. Happy Mother’s Day from all of us at VOKRA. We hope you’ll enjoy this slideshow featuring just some of the moms we’ve rescued so far this year!